Extras available: Garmin GPS, luggage options, Leatt neck braces, jacket & gloves, helmets, route advice, accommodation bookings for self guided tours. Moto Berlin welcomes you! Whether you wish to go on a self-guided ride on one of our reliable BMW GS motorcycles or you want us to help arrange a customized small tour or a large tour, we can do it all. 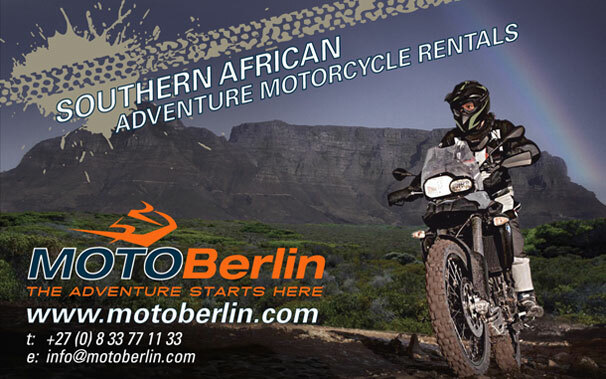 We own our own bikes as do our main competition Motorrad Executive Rentals. Both companies run big fleets and hire out our motorcycles to other tour operators, so look no further and deal directly with us. With the help of some of the country's most experienced guides we will facilitate organizing tours to all parts of Southern Africa. Tours customized around your specific requirements. So whether you wish to do it on your own with a pre-mapped GPS, or a group of friends with back up vehicles, accommodation, qualified tour guides, you name it and we'll do it.